Son and successor of Jehoram, and grandson of Jehoshaphat. 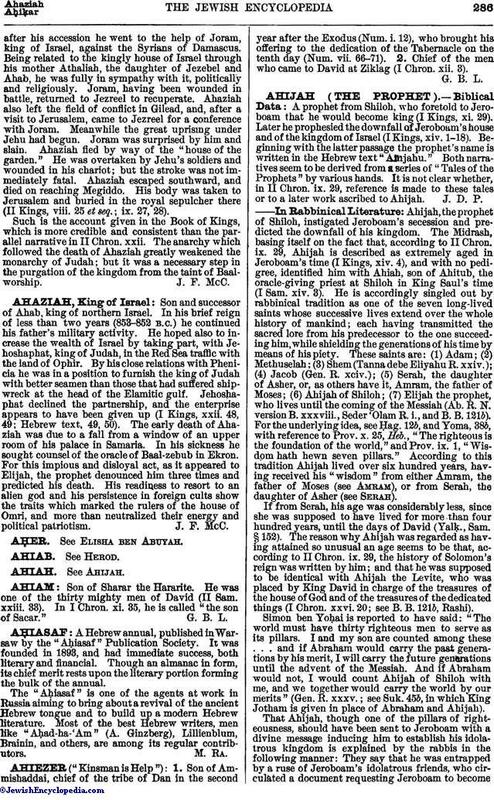 His reign, like that of his namesake of Samaria, was very brief, lasting but a year (843-842 B.C.). Shortlyafter his accession he went to the help of Joram, king of Israel, against the Syrians of Damascus. 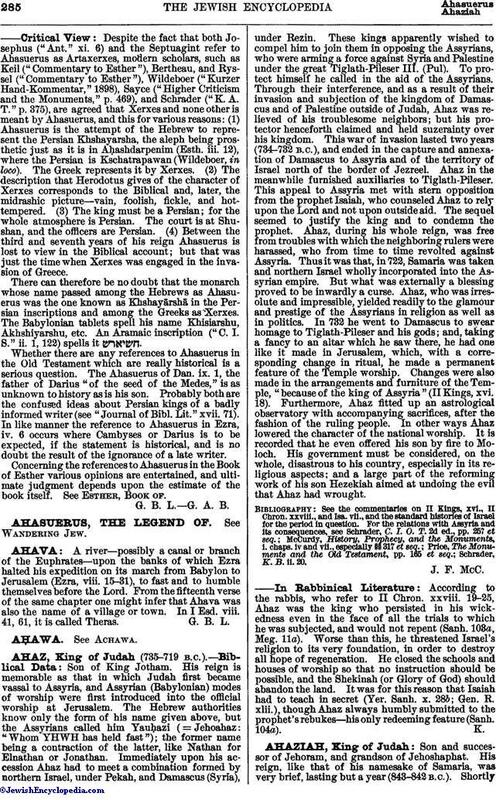 Being related to the kingly house of Israel through his mother Athaliah, the daughter of Jezebel and Ahab, he was fully in sympathy with it, politically and religiously. Joram, having been wounded in battle, returned to Jezreel to recuperate. Ahaziah also left the field of conflict in Gilead, and, after a visit to Jerusalem, came to Jezreel for a conference with Joram. Meanwhile the great uprising under Jehu had begun. Joram was surprised by him and slain. Ahaziah fled by way of the "house of the garden." He was overtaken by Jehu's soldiers and wounded in his chariot; but the stroke was not immediately fatal. Ahaziah escaped southward, and died on reaching Megiddo. His body was taken to Jerusalem and buried in the royal sepulcher there (II Kings, viii. 25 et seq. ; ix. 27, 28). Such is the account given in the Book of Kings, which is more credible and consistent than the parallel narrative in II Chron. xxii. The anarchy which followed the death of Ahaziah greatly weakened the monarchy of Judah; but it was a necessary step in the purgation of the kingdom from the taint of Baal-worship.